Winnipeg and St. Louis may be battling it out on the ice for the Western Conference First Round of the Stanley Cup Playoffs, but we’re here to welcome any Blues fans coming to brave the #WPGWhiteout. When you think about it, our cities really aren’t that different. We may be 1,635 kilometres apart (yes, we use the metric system in Canada), but we’re positive that St. Louis Blues fans will feel right at home in Winnipeg. If you find yourself missing the Mississippi River, head down to The Forks before the game and enjoy a leisurely walk next to the Assiniboine or Red River. Although our rivers aren’t as long as the Mississippi, they’ll still give you Great River Road feels. We heard you like your beer over in St. Louis, so why not check out one of the many microbreweries Winnipeg has to offer? Winnipeg-based Torque Brewing sent a care package to your Center Ice Brewery, so maybe they’ll share with everyone that wasn’t able to make the trip. There's no shortage of craft beer options in Winnipeg, and we’re willing to put any of our 15 local options up against a St. Louis brewery any day. The Gateway Arch is a pretty amazing sight to see, but so is our Esplanade Riel. It’s just a short walk from the hockey action at Bell MTS Place, and links downtown Winnipeg and the iconic Exchange District with our French neighbourhood, St. Boniface. On your way over the bridge stop by Promenade Café and Wine, a bistro that promises some of the best views of Winnipeg's downtown skyline. St. Louis-style pizza looks pretty mouth-watering to us. We might not have cracker-like crust and Provel cheese, but we do have tons of great options for you to grab a bite before entering the #WPGWhiteout. Carbone Coal Fired Pizza is in walking distance of Bell MTS Place, so you might as well head on over and grab a slice or two. There’s a lot of museums in St. Louis (like, A LOT). If you’re looking to check one more off your bucket list, head to the Canadian Museum for Human Rights. Its breathtaking architecture creates a path that takes you on a journey from darkness to light and lets you explore contemporary and historic human rights stories. As you can see, Winnipeg has so many choices to help you feel right at home, but we know you’re here for hockey. 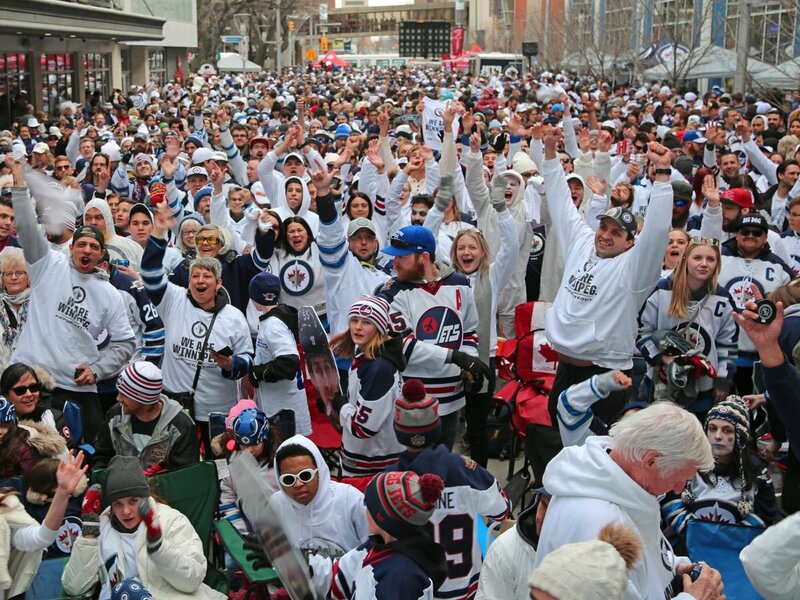 Be sure to stop by the #WPGWhiteout Street Parties to cheer on your team alongside some passionate Winnipeg Jets fans – we promise we’ll be nice!